CISUR and CAMH have led a national evaluation of alcohol policies across all provinces and territories in Canada. This project, also known as "The implementation of evidence-based alcohol policies in Canada: a national knowledge translation project," updates a previous evaluation report released in 2013. The results of this research will be used to inform evidence-based alcohol policies in Canada to reduce and prevent alcohol-related harms. Burton, R. et al. (2017) rapid evidence review of the effectiveness and cost-effectiveness of alcohol control policies: an English perspective. The Lancet. Nelson, T. et al. (2013). Efficacy and the Strength of Evidence of U.S. Alcohol Control Policies. American Journal of Preventive Medicine. Babor, T. et al. (2010). Alcohol: No ordinary commodity – research and public policy – Revised edition. Oxford: Oxford University Press. 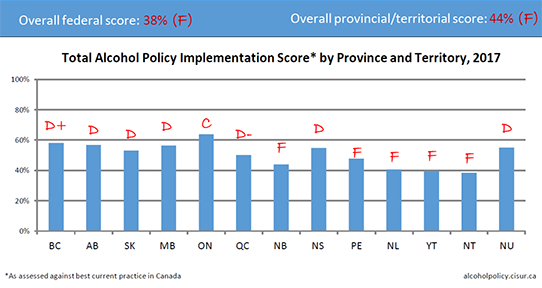 The Provincial and Territorial Canadian Alcohol Policy Evaluation Project is a rigorous assessment of the extent to which evidence-based alcohol policies have been implemented in all 13 jurisdictions in Canada. The study design is based on a similar model conceived of and implemented by MADD Canada assessing the progress of policy measures to reduce impaired driving (see 2015 Provincial Impaired Driving Report). The types of alcohol policies being evaluated at the provincial and territorial level include those with direct evidence of direct effectiveness as a means of reducing population level consumption of alcohol and/or related harms such as: pricing and taxation; physical availability of alcohol; impaired driving countermeasures; marketing and advertising controls; minimum legal drinking age laws; screening, brief intervention and referral programs; and liquor law enforcement. We also assess evidence-based strategies that more indirectly facilitate implementation of the direct policies mentioned above. These strategies include: control systems for the distribution and sale of alcohol; provincial and territorial alcohol strategies; monitoring and reporting of alcohol related harms; and health and safety messaging. A report card will be available for each jurisdiction and comparisons made with a previous national exercise completed in 2013, which was also based on the MADD Canada design. The Federal Canadian Alcohol Policy Evaluation Project is a rigorous assessment of the extent to which evidence-based alcohol policies have been implemented by the federal government in Canada. The study design is based on a similar model conceived of and implemented by MADD Canada assessing the progress of policy measures to reduce impaired driving (see 2015 Provincial Impaired Driving Report). The types of alcohol policies being evaluated at the provincial and territorial level include those with direct evidence of direct effectiveness as a means of reducing population level consumption of alcohol and/or related harms such as: pricing and taxation; physical availability of alcohol; impaired driving countermeasures; marketing and advertising controls; minimum legal drinking age laws; and screening, brief intervention and referral programs. We also assess evidence-based strategies that more indirectly facilitate implementation of the direct policies mentioned above. These strategies include: control systems for the distribution and sale of alcohol; a national alcohol strategy; monitoring and reporting of alcohol related harms; and health and safety messaging. A report card will be available for the federal government.